Planning to build your own log cabin can give you a feel good factor. But, don’t let the uncertainty around the cost of building a cabin put you off! If you haven’t yet started planning, then make sure to read beginner mistakes that cause log cabin projects to fail. Then take a look at log home plans to make sure you have an idea of what you want to achieve. From the cost of foundations and groundwork to windows and doors to insulation and roofing, let me break down the costs of log cabin homes for you. This post will detail my cabin build costs and also the average cabin construction costs. Many of you might know cabin construction techniques, but, this post will reveal all of the materials and costs incurred in building a cabin home. So keep reading if you want to understand the major costs of constructing your own log cabin home. Once you’ve decided upon the plot for your cabin, the first place to start is preparing the site for your cabin’s foundation. If your cabin is 20FT by 15FT then clear 5FT extra each way – so your site preparation area would be 30FT by 25FT. What you are trying to achieve is a clean and level site to work from for the installation of your foundation. Depending upon your cabin’s site, you may be able to relocate all of the debris to another area (if the site is large enough). If you can’t, then you will have to pay for the debris to be removed from site – this is the option we took. The typical cost is $3 per square foot of site cleared. It cost $2,400 for the entire site to be cleared. This included the contractor removing all excess rubble, turf and vegetation off-site. Once the site has been levelled you can then proceed to laying your cabin’s footings and foundation. There are lots of different construction techniques for foundations, which are applicable for log cabins: concrete pads, piles and plinths. We selected a concrete pad for our cabin, this was based on the recommendations of a structural engineer and geographic surveyor. A pad required less excavation work, to extract cavities for the foundation, and hence less waste coming off-site. If your soil type is peat or clay then foundations can require substantial piles to get beneath the damp levels, which is expensive. Our cabin’s foundation cost $1,200, which includes the rebar ($400), concrete ($600) and hard-core ($200) for the cabin’s base. Total cost for site preparation and foundations $3,600. Utilities and services are always a hot topic during cabin construction! Installing utilities and services for your cabin has the potential to radically alter the total finished cost – depending upon your preference of on-grid or off-grid. If you are looking to go off-grid and use a self-sustainable power supply, such as wind turbines and or solar panels, then don’t forget the costs of battery banks to store the power. I would recommend reading about the full costs of off-grid utilities to get a better understanding. If you have purchased an old cabin, which requires restoration, or a piece of land with previous occupancy, then speak to the previous owner. There is a chance utilities and services may already be installed. If the utilities are already installed then you will just be required to pay a service connection fee – this will be around $500. Installing utilities and services requires lots of groundwork, typically trenches to lay the piping, so it’s worth getting a builder and surveyor on-site early to assess the work required. 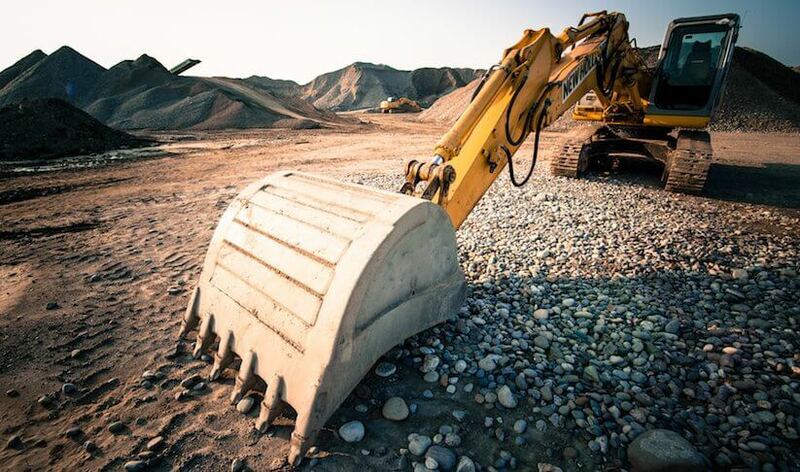 Installing the utilities and services early will prevent you from having to re-work foundations and re-hire expensive plant machinery to dig trenches which could have been done during the start of your cabin build. Our cabin’s services cost $3,000, which included the plumbing ($1,200), electrics ($1,000) and water ($800). Timber and logs can quickly become the most expensive part of your cabin build. For some lucky folks, they will have a natural supply to use. For us, we purchased road-side soft timber logs in lengths of 32FT for $80/ton. Most of the logs were 14” in girth or greater. Once we purchased the logs we got them hauled to a local sawmill to prepare the logs and cut them to size. Then another expense to get the logs hauled back to our camp! Try to use logs with a girth greater than 12” – this will save you money during insulation. Weather proofing your logs is essential; there are lots of techniques for achieving this – I decided to use Permachink. If you aren’t familiar with chinking a log cabin, then look at our tutorial. The Permachink cost $500 and then an additional $550 for foam backers used with the chinking. I then used Permagard to treat the timber logs once they were delivered to site. This was very time consuming and cost around $300, but, it gave me peace of mind that the timber had been treated properly. Once the cabin’s structure was built, you will then need to decide upon your roof. Choosing the right roof and color can really finish the cabin to a high standard and make it look great. Roofing can come in thatch, shingles (felt or cedar), tiles, epdm rubber, slates and tin. I decided to use a tin roof because it was the perfect color and fast to build with. I used 2M x 950mm Bitumen Corrugated Sheets which cost $30 per sheet. Our cabin’s timber and roof bill was $6,600 this includes purchasing, preparing, cutting and constructing the logs. When it comes to insulating a cabin there are almost as many choices as the timber you use. I would suggest that you insulate the floor and roof as a minimum for your log home. 65% to 70% of all your log cabin’s heat is lost through the floor or roof. If you are using smaller girth logs (less than 12”) with a single skin, then I would recommend you look to install a dry-wall interior for better insulation. Alternatively, you can create two skins, in the cavity between the double-wall you can then use insulation or wool to help insulate the cabin. Insulating your cabin is a must if you are planning to use the cabin all year round. After our concrete pad was laid I used a damp proof membrane and then used 50mm kingspan floor insulation. I purchased the kingspan from my local builder’s yard. Kingspan or celotex are both very good for floor insulation. Typically, insulating the inside of your roof is much faster and cheaper than the outside . We decided to insulate the cabin from the inside and used 100mm kingspan. As the waterproof membrane was purchased during the foundation stage, all of the insulation (50mm and 100mm kingspan) cost $1,800 in total. By this point your log cabin will be ready to receive windows, doors and interior fixings to waterproof the cabin. You will have already used Permachink to seal the logs and a waterproof membrane for the foundation slab to prevent damp rising. When it comes to the floor, we used pre-treated tongue and groove finish. The tongue and groove was nailed into the floor joists, which were installed during the foundation and insulation phase. As we had used thick logs we didn’t want to cover them, so, we left the inside of our cabin exposed – apart from the floor and ceiling. The total cost of all the tongue and groove for the flooring was $800. Moving onto the doors and windows. At this point in our cabin build, our cash supplies were dwindling. We decided to up-cycle the windows and doors from craigslist. We have 4 double windows, which are all double-glazed. In addition, the door has two glass panes, which are double-glazed too. You can spend lots more on doors and windows and research into r-values and u-values and their thermal properties. Once you have installed the doors and windows your cabin will now be completely waterproof. Think of it now as an empty canvas! The total cost of all the windows and doors was $500. Total cost for Interior, Windows, Doors and Fixings was $1,300. Building a log cabin yourself was one of the reasons we suggested why you should live in a log cabin. So in our opinion, labour should cost nothing but hard work and sweat! If you aren’t able to, or, are considering hiring professionals to build you a cabin, this can increase your build cost dramatically. The total cost of all the labour for my log cabin was $1,200. I did most of the construction – apart from site clearance, structural engineering and surveyor activities. Having the right tools to build your log cabin will make your construction process much easier and faster. When purchasing tools for my cabin; I made the decision that I was going to purchase high quality tools. Since then, I have used the tools on multiple projects. 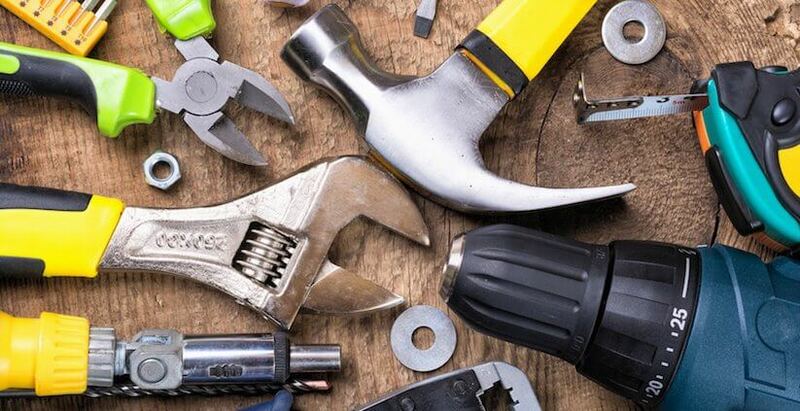 You need to decide if you’re looking for cheaper tools, for just this cabin, or, if you’re going to spend more to purchase higher quality tools that will last. Each tool will have a variety of options from size to brand, so make sure you carefully consider each purchase. I have added the specification next to some of my more expensive tools. Being able to re-use tools for multiple purposes is essential. An example would be to use a chainsaw for logging and cutting timber; instead of purchasing a chainsaw for logging and a table saw to cut the timber to size. Purchasing all of the tools above cost $1,900. If you were to purchase cheaper brands this could be reduced to around $900. Building a log cabin on a budget is achievable. Not only is it achievable but it is possible. Our build cost just under $20,000, well $19,400 to be exact, excluding purchasing the land and the interior. Keep in mind that the size and complexity of your cabin are the most significant factors for cost. Economies of scale can be achieved for larger cabins, but, these savings are minimal compared to the outlay. Use this list as a resource for budgeting for your future cabin. 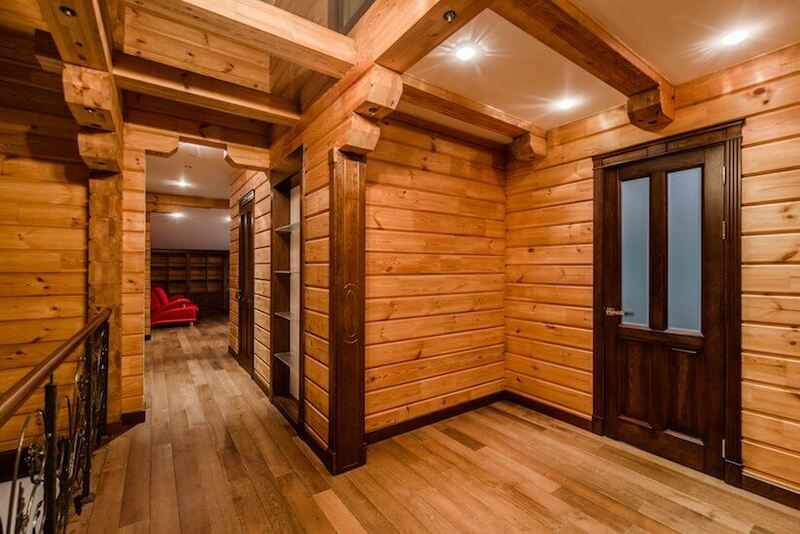 Select the specific materials and costs based on your log home’s specification. For some this post will help them decide if they can afford to build a cabin, and for others it can be used as a comparison against typical brick and mortar homes. I’d love to hear from you if you have built your own cabin on a budget – leave us a comment to let us know how much it cost! Hi, thanks for the informative post. Can you comment on the size of the cabin that you built for this cost? I didn’t see it (or missed it) when reading the post. Glad you enjoyed the article – the cabin was 800 square feet in size. It has a kitchen, bedroom, bathroom and living/dinning room. Hey, thanks for the comprehensive breakdown! Are there any pics from the house being built and/or finished? Alright, my email is ! I am interested in seeing pics of your log cabin… please send! Thank you! Absolutely. We’re just finishing up creating a dropbox gallery so I will share this with you once it’s finished. 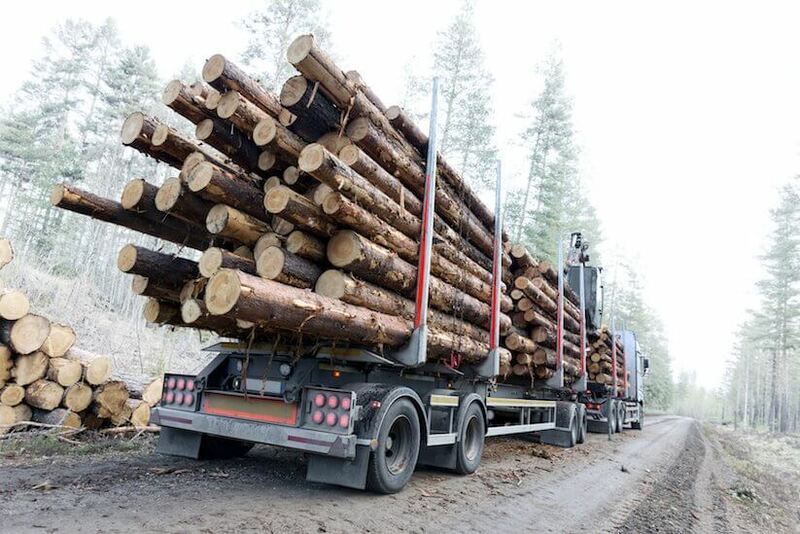 hello David , thank you very much for that article , I am in the process of preparing myself with enough time to finally get my dream log cabing ( less than 1000 sqf ) . I am starting from scratch , I have no land yet ( looking for a suitable location in the Central FL area and checking different log cabings companies and their floor plans . Would you be able to send pics of your cabing ? Any advice will be very much appreciated . I am planning on assisting to couple of Log Homes seminars near my area to lear about timber , building techniques ect . Is Cypress wood the best choice for Central Florida ? or White pine ? Cypress is more costly , right ? You’re right in that cypress is generally more expensive but the ‘best’ depends on what you’re building and also what your budget is. Make sure to read my lumber selection article where I discuss this in much more detail. I live in South africa and would like to find out if its possible to build a real LogCabin 7m x 12m on 2.4m stilts. reason is i would like to fit a pickup under for parking. is there anything i need to look at for proper supporting stilts.? I’ve read your article with great interest, I’ve had some truly scary prices to build a log cabin. If you have any pictures I would appreciate a look. would like to see pictures, thanks! I would love to receive pictures of the process as well! And also I was wondering what is the time frame this all happened in? I just purchased some beautiful lake shore land. It has great layout for a walkout basement with a small log cabin. Any chance you would show me some pictures of it? Please send pictures of cabin. Would love to see the pics from beginning to end! Where wad the cabin built and was there lots of loopholes and costs for the land etc? Sure Dean, the pictures have been emailed to you now. I am planning to build a cabin of my own, your story is very informative and i would like tosee pics of your cabin. Myself and my husband are contemplating building a log cabin within the same size as yourself is there anyway you can send me some pictures so I can swe how the rooms sizes looked , it’s going to be a guest house for my parents when they fly over to stay . Good luck with your project. I have sent the dropbox URL to your email address. In terms of fixtures and fittings cost, this entirely depends upon the quality of the finish you choose. Were costs for adding things like closets or shower tubs accounted for here? I am interested in buying a lot and planning to do this. I realize I have a lot more to consider than that, but first I need to determine if I can afford to do this right. Also do you have any idea how much costs would be (roundabout) for professional builders to do much of the work? I want to do what I can well, but for things like plumbing or electrical, where I only maybe know a hairs worth of what it takes to truly build a good home, how much would I be looking at for professional help? Also, I wanted to thank you for going in depth to write this article and providing such wonderful information! This is invaluable right now as I’m a prospective builder. I actually feel comfortable with some construction. In terms of costs for professional builders, this can vary significantly depending on your location. You’ve best to speak with several local contractors to get an average quote. Thanks so much. This was very informative. I would like to build a similar size to start with, and possibly expand over time ( depending on which kids still live with us when we decide to move permanently). I also plan to do most of the labor as yourself. I am not a carpenter but I’ve learned enough from my father and father in law who are skilled carpenters and tradesmen. They will also be overseeing the project. If you wouldnt mind, I would love to see some pictures of your finished product. Thanks again for the added inspiration! Want to build a community of different structures log cabin houses. Have one property want to reface and revitalized to a log cabin styled home. Starting with the front porch. Good luck with your project Rev! Thank you for this very helpful and inspirational post. I’de love to see some pictures if you’re able to share. I’m in the early planning stages of constructing a log cabin. Thanks so much for this great breakdown. Good luck with your cabin! We are more than happy to help you, sorry to hear about your husband. Please would you let us know what work you’ve currently done on the cabin and what you intend to do and then we can help with an estimated cost. I have enjoyed the article and I am considering building a cabin. I am looking at building on top of flat river stone as a foundation. I would like to know what your thoughts are on that as I have access to lot of rocks. Please let me know your thoughts or concerns. It’s certainly possible it just depends on the condition and depth of the stone. In all likely hood though you would still probably need to add a cement base to the foundation. However, without seeing the stone in person it’s hard to say. Do you have any photos you could email me so I can take a look? We have heard that log cabins have alot of problems with bugs and wasps — issue? Providing you do the correct maintenance and prevention it isn’t a problem. We have an article on our website detailing the preventative steps you need to take. I would love to see pictures. We are considering doing this in the future. Also curious about approximate overall cost. Thanks! Thx for taking the time to write this article, good guidelines. We are in the process of purchasing some land in AZ that may not already have a cabin on it (depending cost, etc…) so, building our own cabin may just be what we need to do. Hi I’m in the stages of planning my log cabin and i’d love to see some photos of your cabin being built and finished if possible, could you also send me a link for the Permaguard and what is the best way to treat the logs when you get them delivered. Thanks! Sure, please use our contact form and email us. We will then arrange for someone to send the pictures to you. Thank you so much for this article. So detailed. I’m interested in bulding 2-3 bedroom cabin with porch as primary residence in Louisiana. Please share pics with me. Thank you for the offer but I’m not looking for any more work at the moment! I saw your information on the site. I was asking, any additional information on sites or reading materials you may have found out after the fact in building that could be of assistance. Thank you again David!!! Did you end up posting any pictures somewhere? I’d really like to see some if possible. Can you please send me pictures? Thank you!! Your article with the detailed cost break-down was quite inspiring. I am thinking of constructing a low cost yet sustainable log cabin like the one you have described through the article. Could you please share few pictures of your cabin including the exterior (showing the lot). Feel free get in touch with what exactly you’d like to know through our contact form. Hello, can you send me some pics os the cabin? Hi ! Can you send me some pictures please ! Love you article btw! Hi David! Im thinking to build a cabin and i would like to see some od the floor plans and pics of the ones you build and total cost please. Thank you for the article. We are in the planning stages of building a log cabin, and this article really helped. Can you please send pictures of the finished cabin you built? We have an old cabin at the site we are planning on building our new cabin and we are still looking for plans to see what would be better at the site. It is only a 1 bed 1 bath with loft or maybe with a basement, and from what you built it sounds like what we are looking on building. Thanks for your time. Can you send me pictures of your cabin as well please? I want to build one around 1,600 sq feet. Does that mean the cost would basically double? Thanks! If I buy a land, how do we handle for city or county approval for cabin? and After we have cabin, how they estimate the property tax for land and this new cabin? It sounds too good to be true. You present the info so organized, logical and understandable for a (got a clue) non-builder that it scares me… I mean to actually ‘think’ I could do it. I want a small log home with large home features miniaturized. That’s all the cool style but small, cozy and affordable. Is there such a plan or is my hearts desire ‘custom’… which is contrary to affordable? Great article. We’ve wanted and looked for almost 30 years to build one. We haven’t been in a position to do it until now. Can you send me the drop box to view your pics? Also, where did you build it. I don’t remember seeing an area. My mother lives with us now and wants her own 800’ cabin next to ours. We’re a little outside San Antonio Texas so not a lot of logs or companies to work with. There are quite a few kit companies around here. But we haven’t found one that we feel isn’t trying to poke our eyes out. I’ll check out your plans. Thanks for being so willing to help the rookies out with advise. Great breakdown of costs and resourcefulness of materials. Thanks. We own an 1870’s hewned log cabin, on a 65′ x 100′ lot we own next to our home in SW Montana. It is currently used as a storage shed. It is approximately 18′ x 24′. I have always thought of restoring it as a small rental home. There is certainly room to add onto it to increase size of living space. My wife has always said it would cost just about the same to restore it as it would to build new. When I look at your numbers, I wonder. It is located such that the foundation could be built, and then just lift it on, or, it could be taken apart and reassembled completely re-chinked in the process. Either way, it sure beats other options I’ve seen for building new. Your thoughts? Thanks for your message. It’s difficult to tell without seeing pictures. Feel free to send them to us via email. Good to see this thread still going even after a few years. I have so many questions…. There is NOWHERE that allows calcs in the costing equation such as %of DIY vs Pros/Labour so I am making best guesses, I’m can put my hand to most things so expecting to get a pro in for a section then I’ll finish it the same way. Is it really cheaper to use and treat your own wood? I have 22 acres of hard wood where I’m going to build and don’t mind felling back an acre or two but assumed it would be cheaper just to buy the timber than screw about getting it hauled off, cut, treated and returned – ideas? Finally re ‘Economy of Scale’ I’m planning quite a large cabin (1800 Ft2) but ALL open plan apart from bathroom, does not having internal walls etc reduce avg cost per sq ft?. Great to hear from you and I’m glad you’re excited about your project! Let me give you some basic numbers to work with. If you purchase a log cabin kit for $50,000 then labor will be $50,000 to build and another $50,000 will be required for additional costs such as land, sub-floors, interior finish and foundations. So a $50,000 kit costs $150,000 finished including labor fees. This is known as the golden ratio of 1:2 (without labor) or 1:3 (with labor). Obviously you are not purchasing a kit. But you can work backwards. So find a kit which is 1,800 square feet and use the cost of the kit with the ratios above to get rough estimations of cost! If it cheaper to use your own lumber. Yes. However, you should factor in the cost of your time too! If you have a job and time is previous, then re-think this assumption. Yes, not having internal walls reduces cost per square feet of construction, but may increase your HVAC costs depending upon the design. Really happy you survived your journey, I will be starting mine soon (maybe this summer?). Your journey/ post was amazing, and really want to thank you for sharing. I’ve been researching for quite some time on the matter, and your break-down provided was “SPOT ON” for what I been looking for. I retired from the military in 2014 and then finished my doctoral. I work for the government now and need to concentrate on “Family.” I’ve missed out on a lot of family time with my wife, son (19yrs) & daughter (21yrs) due to military training and numerous deployments. I believe it’s time to get back some missed time. Building a log cabin and spending some quality time with the family will bring about some great memories for the future. Hey there, I am definitely interested in seeing the pictures of your final result! We live on 5.5 acres in Mississippi. I am exploring options for my mother to move out here with us. We’ve received a quote of 60k from a contractor to have an addition built. This seems like it might be a better option. In a reply to one of the comments, you said that the $19,400 was the shell and no interior. Does that include having electricity, sewer, etc, ran to it? I was thinking probably not, but wanted to get clarification. I’d also like to see your pics. Thanks!!!! These prices include our cabin’s services costs which were around $3,000. This included installing all the cabin’s services, but we didn’t require them to be run to the cabin as they were existing. Good day!, This was an awesome read, Thank you for taking the time to break it down. I would love to see the photos if you don’t mind. I am in love with this idea and your beautiful cabin. Didn’t know if you could send me pics of interior?? After installing interior finishes how much was the total cost? great article – Im about to buy land and build. Please send me the pics – and how long it took you to build? (how many people built). Many blessings for your life. I would love to see pictures. Also, what is the timeline? We just purchased our first 20 acres and plan to build a cabin within the next two years. But I need a little bigger because our special needs adult son will be with us. Your post is inspiring! Take a look here for a full guide on timelines! I would also love to see your photos. We just bought some land for a cabin and we are starting to budget for the build. We are hoping for something a bit bigger than yours( maybe 1500 sqft), but your infomation is great. Thank you for all the great info. Could you send me the photos or a link also? Hi we have been looking for our first home to purchase and after reading your article this sounds alot better then dropping over $100,000 on a house thats not even ours! Can you please send pics of your cabin it would be much appreciated thanks!! Hi David! WOW! How nice of you to have shared all of this information AND to respond to all the inquiries you’ve received! I am considering building a small log home also… 800 to 1000 square feet. This has been so helpful! Would you mind sharing your pictures with me also? Hello David, thank you for all the extensively detailed information. I’ve downloaded and skimmed the first two chapters of your book, and appreciate your responses to reader comments (it’s so helpful to have a real answer about how much I really will have to pay for various approaches!). Could you please send to me whatever additional information and photos you have about your build? I’ve never done full-on construction before, but I have volunteered with Habitat for Humanity a few times, and do a lot of repairs and small improvements to my old home. I’m hoping to learn enough to take the leap and build my own cabin. My husband and I are about to start our cabin this spring in Alaska, and I would love to see your cabin pictures, please. I appreciate the time you’ve taken to share your information. Thank you! And God bless! Excellent article!!! If you are still sharing them, I would love to see the pictures of your Cabin build and finished product. Thank you! I am at my email address given. Thank you, again! I too would appreciate if you can email me the construction pics of the build up of your $20,000 log cabin. Great information. Could you please send my pictures of your cabin when it’s convenient? I appreciate it!